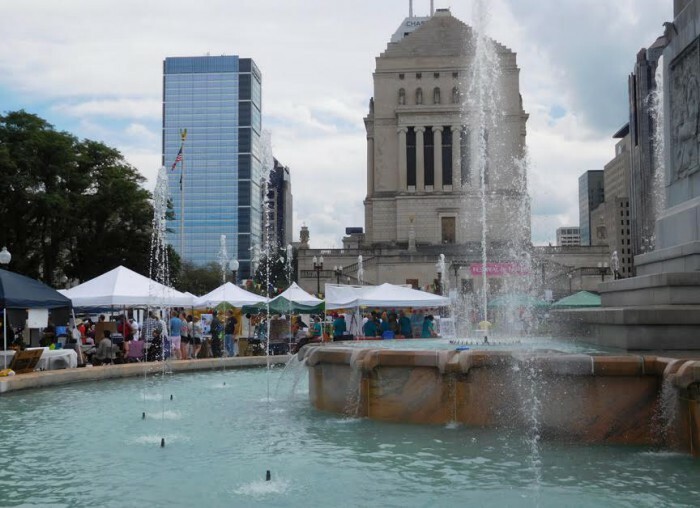 CIC Board member and Interfaith Ambassador KP Singh, who knows more than anyone about sacred arts, shares his impressions of the 2016 Indy Festival of Faiths Sacred Arts Stage on SikhNet. September 18, 2016: This year’s Indy Festival of Faiths was designated by Indiana Bicentennial Commission as a Bicentennial Legacy Project. True to the theme, “The History of Religions in Indiana,” the nearly one hundred religious displays and cultural booths of area faith communities scattered across the Veterans Memorial Plaza in Downtown Indianapolis reflected, highlighted, projected, and shared glimpses of the traditions, cultures, heritage, civic engagements, faith-based initiatives and humanitarian spirit of faith communities that form the spiritual and cultural fabric of Indiana. The Festival encouraged interactive displays and fun activities; there was a processional of faith leaders and table conversations on a variety of common social issues and community concerns. Amazing performers and engaging faith volunteers attracted the interest of Festival visitors to learn about faiths different from their own. The annual Indy Festival of Faiths is the signature event of the Center for Interfaith Cooperation. 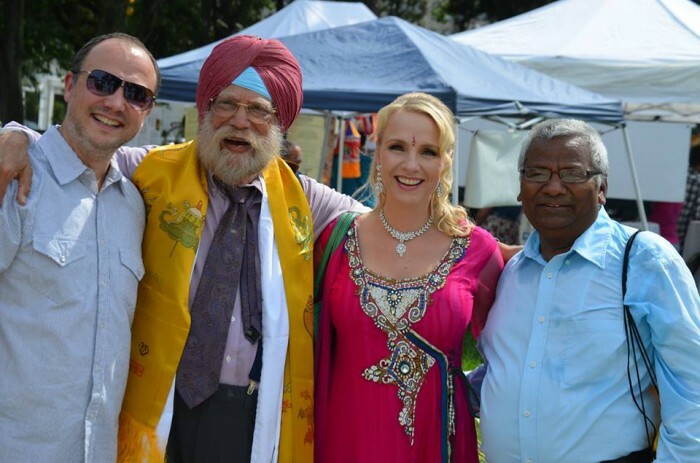 Maninder Singh Walia, former President of The Sikh Satsang of Indianapolis served as the Master of Ceremonies. Major faiths – Christian, Catholic, Muslim, Hindu, Buddhist, Jain, Sikh, Quaker, Baha’i, and other faiths, educational and cultural groups created intriguing exhibits, special experiences, and valuable faith-histories for the occasion. The Sikh Satsang display offered colorful posters that introduced the Festival guests to famous and distinguished Sikhs in North America; many engagements and humanitarian efforts of Sikhs in Central Indiana over the last fifty years; other posters and flyers highlighting Sikh faith, culture, traditions, and community. To give a living testimony to the central commandment of service, the Sikhs offered free bottled water to everyone on the hot sunny afternoon. As at previous Festivals of Faith, interfaith gatherings, community celebrations, and worthy humanitarian initiatives, the Sikh Americans thoughtfully embraced the precept enshrined throughout the Sikh Scriptures: “recognizing all humanity as one race” and promoted a spirit of one brotherhood by interacting with people of other faiths, cultures, and communities. A loving spirit seem to manifest before us at the festival of faiths in the public square. The Festival was a feast for the eyes, heart, and spirit: traditional Sikh turbans and T-shirts with emblazoned causes; brocaded saris, embroidered Punjabi dresses, and colorful African costumes; hijabs and other interesting head coverings. A spirit of excitement about sharing culture and a genuine effort to know about one another seemed to affirm the spirit of the Festival. For one brief moment, friendliness, kindness, and our common humanity seemed to make a seamless circle of oneness, a living testimony of “Manus Kee Jaat Subhay Ekkay Hee Pahchanbo: Recognizing all humanity as One Race” manifested before us. That made many hearts and spirits fill with joy of the possible. I wondered when such a vision and pilgrimage may become a reality across cultural, ethnic, and faith spectrums and divides; enveloping the whole world in a long-awaited “Amazing Grace” at every crossroads of the human universe. In hope and trust, respect and kindness, compassion and a unifying spirit, with seva (selfless service) as our anchor, imagine walking in faith and taking the forward steps toward this unfinished prayer and unrealized vision. The Supreme Immaculate Eternal Reality: Waheguru (Sikh); Wonderful Lord, King of Kings (Christian); Grandfather Spirit, Wakan Tanka (Native American); Yahweh (Jewish); Ishwar (Hindu); Allah (Moslem); God Almighty with innumerable glorious Names and unfathomable attributes will take us from there.